One day in April 1987 I received a telephone call by László Beke, he asked me, if I had time on that evening. I had time and so we went to the "Budapest-Fotoclub", where Dr. Gerlinde Schrammel was talking about "Contemporary Austrian Photography". The topic of the report was more interesting than the Photoclub, where the address was delivered. Later we went somewhere, talking about experiences, opinions, but never about photography. The next day we visited some exhibitions and I showed to Gerlinde some former works exhibited formally in the Liget-Gallery and works of my own collection and, of course I presented various catalogues and journals. I was afraid to ask for helping to realize exhibitions by Austrian artistas, because I did'nt know whether she liked Liget's activities or she was just polite. At the moment, John and I, we are sitting in a pub near the Gallery. He is writing about the Liget. Soon the opening of an exhibition by Polish photographers is ready. In meantime, a friend of mine has arrived and we pass the time waiting for Gerlinde coming from Vienna. Finally, a few words about this topic: from the relationship between Fotogalerie Wien and Liget-Gallery two exhibitions have emerged so far: one in November 1987 "Heinz Cibulka" and another one in March 1988 "Michaela Moscouw" for which I am very grateful and I hope that this cooperation will continue. And now a few remarks about Liget-Gallery: All advantages and qualities arise from its disadvantages. The most important quality is the "imbreeding" and the cooperative acting and thinking. Exhibitions, concerts, speeches and other events do not address to a small number of selected individuals but only to ourselves. Of course, there were a lot of important events, but in my opinion, these events which are important fot us bring good resoults provided that we ourselves change through them and that they don not change us. When I walk to my friends, we do not talk about past and future exhibitions, and not about visitors and cooperation; for the Liget-Gallery everything is indifferent, temporary, sometimes we stay together talking about this only occasionaly. I am not the director, but directed. And this last butnot least, because people working and exposing here and I myself, we do not depend on materialistic interests such as money, prestige or other things. I came to Budapest in 1986 to prepare an exhibition of photography by artists from Eastern Europe that I had been working on since 1983. More than 100 artists from throughout Eastern Europe , Yugoslavia and the USSR responded to the invitation to participate, but the exhibition, held at the Liget-Galéria, was "mixed-bag" of photographic prictices, revealing both the amazing diversity of creative activities in these nations and my own ignorance of the traditions and conditions which underscore these activities. Since that time I have travelled often in Hungary, Czechoslovakia, the DDR and Poland, meeting with the artists I have come to know here. Their almost relentless program for de-mystifying my Western conceptions of what exactly constitutes an Eastern European artist has been invaluable to their progress of my project, as well as my growth as a thinking, understanding human being. A similar program is available to viewers of this exhibition. Do not look for concensus, a similarity of style, in these photographs. Note, rather, the remarkable diversity of both ideas and manipulations of the photographic medium. An aesthetic philosophy, such as divides and informs much Western photography into "given" genres such as photojournalism, portraiture, documentary and so forth, cannot be applied to these works. The freedom from such "Art World" constrains should be regarded not as an affront to the viewers concepts of photoaesthetics, but as an emancipation from pre-conceptions. The rejection of concensus in these works is an invitation to experimentation from which we can benefit considerably. them, but didn't send it to me until after my text had already been written. The experience was humiliating (they continue to laugh about it today...). It was also my first real moment of pure understanding of these artists and their works. How, after all, could such a list, even with so many questions, possibly shed light on these works? It could only seek concensus where none exists, imposing uniformity where, in fact, categorization is defiantly rejected. Today, the greatest influence on my own photographs is the independence theat I have learned here in Hungary. 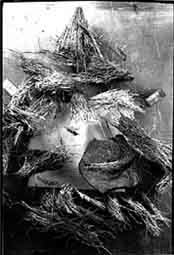 The old Hungarian tradition in photography known from artists like Kertész, Moholy-Nagy, Kepes, Capa, Brassai and so on, had, continuity in spite of the 2nd world war and the period afterwards. One of the causes of this continuity is the great enthusiasm for photography in this country. It is shown also in the Hungarian artists' attempt to keep themselves informed about art and photography. Contrary to the photographic situation in Western Europe and in the USA, in Hungary exists an "Official Photography". This photography is supported by different organisations and promoted by exhibitions. In addition, there exists an "Underground-Photography" called by John P. Jacob also "Private Photogrphy"(1), whose artists - and I adopt the word "artist" on purpose - contemplate photography and make use of it in different ways. In the seventies the actions and performances by Tibor Hajas, who was killed in a car-accident in 1980, were of basic importance for photography. Hajas is cultivating an intelectual way of actionism, which reminds the Viennese Rudolf Schwarzkogler, although different in many ways, so for example, with regard to the contens. Tibor Hajas arranges his actions in the sense of the question for "what EXISTS" and puts it in contrast to the possibility of perception and "what we SEE". Photography becomes an integrated part of his actions and "mise en scéne" and, from progressing documentation to perception, it becomes an autonomous form of artistic expression. Often, the young János Vető was working together with Hajas and as a consequence always confronted with painting, he arrives at his personal modus, using photography in his stillifes. Strange objects are interpreted in a different way and transformed into dramatic sceneries, but always with a smile. András Baranyay, coming from painting and graphics uses obviously photography as an enlargement of this graphical technincs. Significant for him is the formal aspect, also in the detail. An exemple are the hand-studies, he has developped since the sixties. 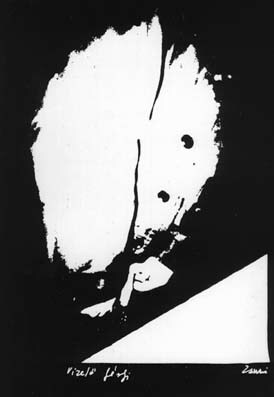 His self-portrait-series dated 1979 is known and famous, showing the relation between certainty by form - the stripes of the shirt as point of rest - and uncertainty by movement, which covers nature until reaching almost anonymity revealing it at the same time. The international reknown photographs by Kerekes are the pictures of cities and architecture containing a "dematerialized". By means of diaphragm-aperture it is possible to catch a continuing movement, which seems to be a process of ageing. In these pictures we see the same impression of decadence one often finds in towns. A photographer working with high perfection and sensuality for perfect photos is Attila Vécsy. Also for him movement is an important part of his work, similar to Kerekes. Árpád Fákó, a representative of the young Hungarian generation of photographers is also influenced by actionism and performance. He is transforming his "mise en scéne" in a conscious, subjective and experimental way giving them a frivolous touch. An example is the series "Fish-Smile" dated 1984. Remarkable in the Hungarian situation of photography and, in contrary to Western countries, especially Austria, is the small number of female photographers. Zsuzsanna Ujj and Lenke Szilágyi are exceptions: two woman different in nature and work. a body, a face stopped abruptly in motion. Lenke Szilágyi is the typical representative of "Subjective" photography. Her works resoult spontaneously from her environments with her special point of view. It seems to be staged, but it is false. Lenke has not fixed on a certain subject, she remains subjective. Tibor Zátonyi, also a representative of "Subjective" photography, focusses on documentation comparable with West German Subjective Photography of the seventies. We can find good knowledge of photography of the last two decennies in West Europein the works by István Halas. This artist and photographer elaborates his townscapes and interiors in a subtil and intellectual way transforming his own impression to a formal expression. He uses parts of the pictures on other creating "tableaux" with an alterated statement. Tibor Várnagy deserves a special place in the Hungarian Avantgarde Scene and not only for his merits as exhibitor and gallerist. Above all, Tibor is working as an artist in the visual experimental fieldof photography, where movement and contingency of situation are very important. Typical for his oeuvre is the simultaneous working with picture and letters, whereby the content of text is less important. 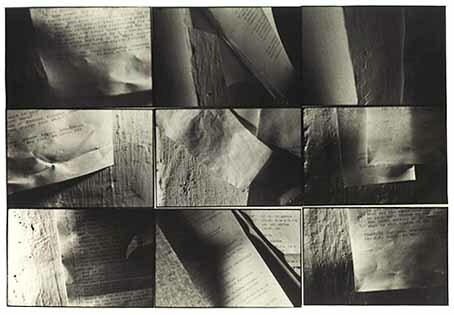 With this connection of word and image he is close to famous artists such as Duane Michals, Christian Vogt, Bodo Hell, Peter Dressler etc, but with difference, that Várnagy is using letters and words as a part of the composition of his pictures; his xerox-books are a tipical example. Tibor Várnagy represents a style he refers to SCHNASS, also in the Liget-Gallery (the only gallery in Budapest, which is exposing experimental avantgarde). Translated as "trifling, less than important". Schnass will be understud as an experiment to create unique and humorous artworks in relation to high sophisticated ideas and low material quality. (4) Also, the oeuvre by Várnagy should be understood in such a way. Interesting for the photographic avantgarde in Budapest - which I can treat in this catalogue only partly - is the closeness to to past actions and performances, wereby it has not visualized a repetition, but a development to release and liberty. Performance-art as a total artwork, where the documentation becomes a very important and essenttial part, which - liberated from the origin - gains independence as artwork. Perhaps, just Schnass is the basis for this positive evolution.